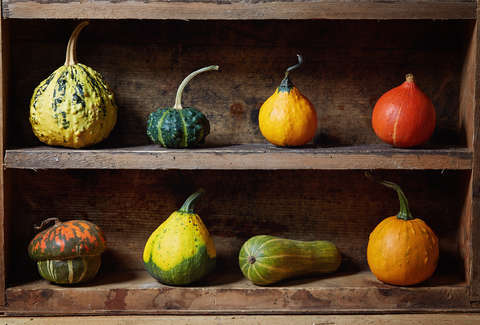 Can You Eat Your Seasonal, Decorative Gourds? For centuries, seasonal-minded, autumnal-embracing folks have welcomed fall with a bounty of decorative gourds atop their dining room tables, mantles, and front porches. This phenomenon has reached new levels of ubiquity -- laced with classic generational irony -- nearly one decade ago, with this continually resurfaced McSweeny's joke piece. And sure. 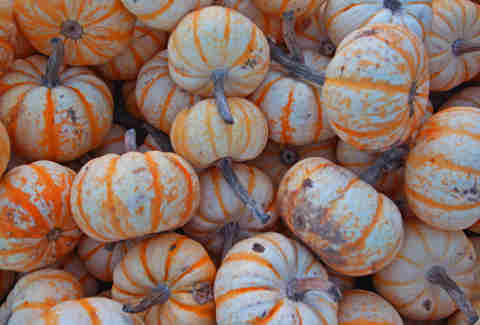 Decorative gourds are fun, relatively harmless, and give any room a small dose of October charm. But have you ever wondered (aloud or otherwise), "Hey, can you eat those suckers?" Well, since you are already here, let's assume you have. First off: What's the difference between pumpkins, gourds, and squash? This is not as dumb of a question as it might seem. All three are subcategories of the Cucurbitaceae family, meaning they are all fruits that stem (hehe) from herbaceous vining plants. Their genetics and terminology tend to overlap to a bewildering degree. The word "pumpkin" doesn't really pertain to much, botanically, as it is really just a type of squash (as is butternut squash or acorn squash, for example). While the word "gourd" is meant to represent a different branch of the Cucurbitaceae family. Generally, gourds are going to have rigid exteriors, and don't have an abundance of "fleshy" insides that make them good eats -- unlike squash. Most squash is cultivated for consumption, while most gourds are grown for purely decorative purposes. So really, when people define something as a gourd, they basically mean "inedible squash." But again, these definitions are more circumstantial than anything else. A full-grown pumpkin can be considered a squash -- but when you think about the miniature pumpkins (the ones you might paint in kindergarten), those are more like gourds, because they are small, extremely hard to open, and don't contain much edible substance. So, I can eat gourds... or will I die? You won't die -- but, there are some inherent difficulties in eating gourds. Mainly, they're hard to cook, hard to eat, and... well, for the most part, you probably just don't want to eat them. If you did, they'd be squashes. Get it? What do gourds even taste like? The simple answer? Pretty much like less-tasty squashes, definitely more bitter. In some cases, they can have a pseudo-zucchini flavor (as zucchinis are actually squashes, if you didn't know). What type of gourds are actually edible? The better question is: When should we eat gourds? The trick to eating gourds, if you want to do that in the first place, is eating them before they are fully "ripe," basically the earlier the better. Younger gourds will be be softer, more malleable, and easier to cut into. The longer you wait, the tougher and more bitter your gourd will be. But it doesn't really matter which kind you decide to eat, to be honest. Let's assume I want to do this: How do I cook them? You are going to want to treat them like any other squash. Peel the skin -- the skin will often be super bitter, so you'll probably want to get rid of as much of it as possible -- then scoop out the flesh inside (which is the part you want to eat) and... from there on out, it's pretty much up to you. You are definitely going to want to cook them (preferably in boiling water for 20 minutes, or in your oven for about an hour at 350 degrees). From there, you can add them to stews, soups, or even just eat them raw (Warning: This won't be good). And don't forget about the seeds. Just like you can sprinkle a little bit of parmesan cheese atop a plate of pumpkin seeds, your gourd seeds have the chance to be a light bite ideal for autumn snacking. Just... you know, they probably won't be as good. So you're saying I can eat those mini-pumpkins? Well, yes. But eat them while they're still white, before they turn green and/or orange. But also, maybe just decide to paint them, put them on your porch, and eat some butternut squash instead.